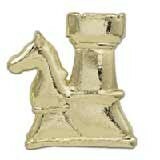 Wearing this golden rook/knight chess pin will make you proud to be associated with the royal game of chess. Button clasp back makes it versatile as it can be used as a tie tack, as well. Each individual pin comes in a small poly bag. This pin makes a great "gift" for players at tournaments.